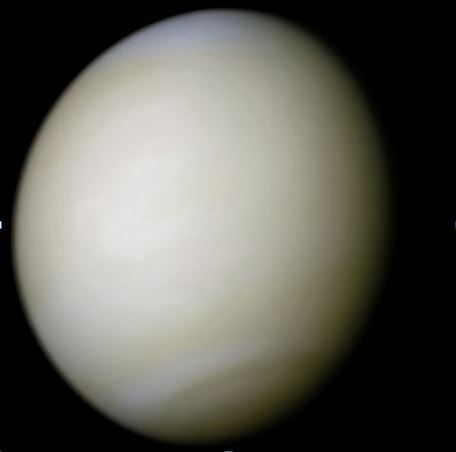 For the last few months I have been writing an e-book on the planet Venus, the planet closest to the Earth in distance, size and internal composition, and the third brightest natural object in our sky after the Sun and the Moon. The book is now finished and is available to download in Kindle format by clicking here if you are based in the UK or here if you are based in the US. To download the book in other countries, see the notes at the end of this post. For the five days starting on 7 December 2018, as a Christmas gift, I will make this book free to all my readers. Some of the topics included in the book are as follows. How Venus appears from Earth and the fact that Venus’s phases can only be explained by a heliocentric theory and not the geocentric theory. Exploration of the Venus by spacecraft. These missions discovered a harsh hostile world, where the surface temperature is nearly five hundred degrees Celsius and the atmospheric pressure is a crushing 92 times that of Earth. The transit of Venus, an astronomical event in which Venus appears to cross the surface of the Sun. Observations of the transit of Venus were critical to the development of astronomy in the seventeenth and eighteenth centuries. Settling on and terraforming the planet. If your country isn’t in the list above, then you won’t be able to download the book from Amazon in Kindle format. However, until the end of 2018, you will be able to download the book free of charge (in pdf format) from the following webpage. Awesome! Venus is my favorite planet, and I can’t argue with a price of free! Quick tip – use http://www.booklinker.net to get a universal link to your book on Amazon, automatically redirecting to the appropriate international Amazon store. Very generous! Thank you! Do you have any plans for a similar book about Mars or the various dwarf planets? I have two other ebooks both in Kindle format which can be downloaded from Amazon. One is about the Moon and the other is about the Search for extraterrestrial life.